Don’t let an upset stomach keep you down! Have a cup of ginger tea instead. This herbal tea is the perfect solution to help you deal with indigestion or feelings of nausea, and these are just a few of its many benefits. If you like hot and spicy flavors then this is the tea for you. It is an infusion packed with flavor and great benefits that will make this tea a favorite whether your health needs a boost or you just fancy a nice tasty drink. Come and find out all this herb has to offer and the many ways you can make this tea. Let’s enjoy a cup of hot tea together! Ginger, from the Latin zinziber officinale, is quite a pungent herb also known as hot root. More accurately ginger is a rhizome, as it is a stem that grows underground in fertile tropical regions, with plenty of moisture and shade. Native to Southeast Asia, it is now cultivated in many regions around the world, particularly in Jamaica and is harvested year-round. The ginger plant is a perennial that is about 1meter (~3.3ft) tall, has white and pink buds that turn into yellow fragrant flowers and has dark green leaves. The rhizome itself is thick and knotted, white to yellow in color, fleshy and juicy, and ranges from mild to spicy in flavor. The African ginger variety is considered one of the strongest and most pungent of all ginger varieties and is often preferred for medicinal herbal blends, whereas the Chinese varieties are milder and more adequate for cooking. Ginger has been used for many centuries by a great number of peoples around the world for all kinds of treatments. The very first to cultivate this herb for the benefits of ginger tea for indigestion were the Chinese and the Indians as part of their medical tradition. From there it spread to other parts of the world, but India and China still remain two of the largest ginger producers today. The Arabic traders eventually brought ginger to Europe, where it was mainly used to make tea for treating cold symptoms and the flu and for a long time it was also used to soothe the stomach and to blend with other herbs. Today, many cultures in the East and in the West still use ginger to treat the same symptoms as the Chinese did in the beginning, having created many variations on the simple ginger root tea recipe presented below. It is also greatly used as an ingredient or condiment in cooking in many culinary traditions. Ginger is used in flavoring seafood, meat, vegetarian dishes, even cookies and other deserts. It can also be made into candy or juice and is greatly enjoyed on its own. Ginger is a wonderful energizing herb full of health benefits so come and learn all you can benefit from when drinking ginger root tea regularly. Tea is the best form of consuming ginger. It is gentler way of making the most of the benefits of ginger even for those who don’t always enjoy ginger in their food. This herbal infusion is a great source of vitamins C and B6, magnesium and potassium. In addition, alkaloids, mucilage, phenols and a variety of volatile oils (gingerols, shogaols, and zingerone) make this a well-rounded tea that helps you in many ways. The main benefit of tea made with ginger is to help improve your digestion. So if you suffer from bad digestion this tea is for you. The vitamin B6 in this herb will help your metabolism to improve and the extra fiber will settle your stomach. Have a cup of this herbal tea when you have an upset stomach as it aids in neutralizing acids and boosting the production of digestive juices. Reducing acid reflux may also help with certain ulcers, but take this tea moderately. Drink it after dinner to calm your stomach. Ginger root tea may work on the intestinal track helping your body get rid of waste easier. Its mild laxative and antispasmodic action will help soothe intestinal cramps when you are feeling bloated and battling with constipation and flatulence. It also works to treat diarrhea and help treat parasitic infections in your digestive tract. Ginger tea also helps to promote weight loss as a result of an improved digestive system. It boosts the digestive enzymes that work on proteins and fats and increases the rate at which you burn calories. Be careful though, a healthier digestive system may also stimulate a weak appetite, so make sure to eat healthy and nutritious food to help maintain your stomach feeling and working great. Drinking a ginger infusion regularly will aid you in fighting cravings for sugars and alcoholic beverages. Can’t seem to be able to keep your food down? Then take a cup of ginger root tea. You’ll be surprised to know this herb works on other types of nausea, not only that which is caused by bad digestion. Take this tea if you suffer from motion sickness. 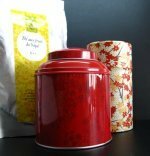 Before leaving your house take a cup of ginger tea and pack a thermos to take on trips. Nausea can also be the result of morning sickness, so as long as your doctor approves, take a cup of ginger root tea to calm your stomach. Use moderation. And what if you have been sick already? Then take this tea not only to calm your stomach, but also to freshen up your breath as well. Feeling cold? Can’t stop coughing and your body is hurting? There is a good chance that you’ve caught a cold and may be running a fever. Tea can be quite soothing during these periods and ginger root tea doubly so. Ginger root tea is a warming tea that will make you feel comfortable and improve your recovery time. It is packed with vitamin C which helps to ward off colds and the flu and relieves their nasty symptoms. It helps promote sweat to help bring down your fever. A cup of this herbal tea will help relieve coughs and soothe a sore throat, treating the infection and making it much easier to swallow food. It is a great expectorant helping to expel catarrh and clearing your lungs and respiratory tract of harmful fluids causing congestion. It may also aid in more serious respiratory illnesses such as bronchitis or asthma and when you are suffering from allergies and sinusitis. So next spring, take a cup of tea when pollens start making you sneeze. Ginger is a great herb for your heart. A cup of this tea can help improve your circulation, stimulating blood flow, giving you a warm feeling if you have cold hands and feet and helping you deal with varicose veins and ear infections. This tea may also help to dilate your blood vessels and prevent clotting, thus reducing the risk of stroke or heart attacks. By inhibiting fat from depositing in your blood vessels, your bad cholesterol (LDL) levels will decrease. Another great benefit of ginger tea for a healthy heart is that it helps to reduce your blood sugar levels and improving your blood pressure levels in a sustainable way, because of its potassium content. Now that ginger has made your blood flow you will also feel that you have more energy and vitality. This herb is considered nourishing and restorative helping to reduce convalescence time when you have been sick. This warm stimulating tea boosts your immune system, giving you strength and building your defenses against disease. Combine it with honey for added immunity against inflammation. With proper blood flow and a balanced system, ginger tea also helps to fight headaches and migraines, soothing your nerves, relieving anxiety and enhancing your mood. Less stress is also reflected on your skin: it looks fresh and has less acne. Ginger tea acts on the liver, improving its ability to function and keeping your hormones at the proper level. This in turn will have numerous advantages for your reproductive organs. It strengthens your reproductive system by boosting blood flow to the pelvic region, helping to bring on delayed or scanty periods and regulating cycles. No more need to feel the awful pain of menstrual cramps and endure the symptoms of PMS every single month. Important note: talk to your doctor about drinking ginger tea while pregnant. It may help with nausea, but should be approved by your doctor first due to its potent effects on the uterus. Ginger also contains magnesium which is great to help relieve menopausal symptoms and at the same time bring strength to your muscles and bones. Ginger tea may also help the liver in men to function better and improve their hormone levels. It may aid in restoring strength and vitality, toning the reproductive organs. It will improve potency issues by increasing energy and libido in men. Run a bath with ginger and soak in it to cleanse and purify your skin. It helps to warm both your feet and your hands, but cold extremities may also be a sign of poor circulation so consider drinking a cup or two of ginger tea as well. This tea reduces inflammation and gets rid of fungi, therefore if you suffer from athlete’s foot, prepare a cool tin of ginger tea and soak your feet for about 10-15 minutes twice a day to relieve itching and burning. Its antiseptic function may help to heal wounds. Ginger tea can be used topically in compresses to help relieve rheumatic and arthritic pain, and muscle stiffness, for example in the neck region. Internally, it will promote blood flow and help rid the body of toxins that are causing inflammation. Studies are being made into the potential benefit of ginger tea as a treatment for gastric and colon cancer. Although results seem to be promising, showing that ginger tea may slow the growth of cancer cells, this is still being tested. With the approval of your physician, ginger tea may bring some relief if you are undergoing chemotherapy, reducing the nausea that generally follows the treatments. Have your doctor monitor your reaction to the tea while on medication. The analgesic properties of this herbal tea are a great asset for those dealing every day with chronic pain and need to control it. It may be of benefit to people that have a higher risk of suffering from Alzheimer’s disease as ginger tea may be useful in delaying symptoms of onset and progression of this type of neurodegenerative disorder. Try a cup of ginger root tea now! Ginger root tea has many benefits and is generally considered safe, but you should also take note of some possible interactions with medication you may be taking or any side effects you may experience that warrant a visit to the doctor. While ginger root tea is great to improve your digestion, too much can actually cause stomach pain and heartburn and bring on such symptoms as nausea and diarrhea, or even just irritation of the mouth tissues. If you suffer from this you may be either too sensitive to ginger tea or taking too much, so make sure to cut back on your tea. Watch out for a little belching, too! One of the effects of ginger root tea is the increase of digestive juices and bile, while this is good to promote digestion, it may worsen your condition if you suffer from peptic ulcers or gallstones. This tea may be stimulating, for some who are more sensitive, this means that it may cause you to be restless and even lose sleep, so try to drink this tea a few hours before going to bed. Watch out for very rare symptoms of allergies, such as rashes, particularly if you are applying this tea to your skin. If you are taking blood thinners, like aspirin or heart medication, you should speak to your doctor prior to taking this tea, because it boosts circulation and may enhance the effects of the medication beyond the safety levels. Are you up for surgery any time soon? Mark on your calendar a period of 5-7 weeks prior to it and don’t drink ginger tea during that time so that you are not affected by its anti-clotting action. Though this is a perfectly safe tea to give to a child over 2 years of age for digestive pains or nausea, best not give ginger root tea to your baby and always adjust the quantity to the weight of your child. If you are taking medication for diabetes, make sure to speak to your doctor about taking ginger tea medicinally. This herb affects your blood sugar level so your doctor may either wish to recommend against it or monitor your progress. There is some controversy in terms of drinking ginger root tea while pregnant. While it may be helpful with nausea, it does boost circulation to the reproductive organs and may stimulate uterine contractions. Best advice: Talk to your doctor and follow his advice. Each pregnancy is different, so different precautions may be required. Let’s learn how to make ginger tea and enjoy a cup of good hot tea. 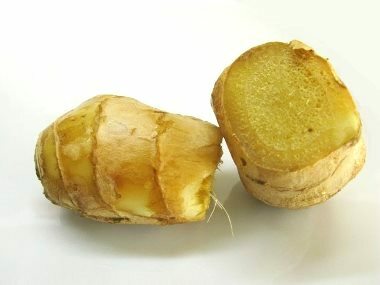 Ginger root tea can be made from either fresh root or grounded powder, but using the fresh root makes much better tea. Let’s see how to do it. Start by choosing a piece of root that is about 5cm (2in approx.) long, then peel the outer skin and cut up into long thin slices. It’s easier if you cut the root diagonally, you can get thinner and longer slices. Note: Some people like to grate the ginger, but if you cut it up into slices, you can reuse it later on. Place about 4 cups (1liter) of water and bring it to a boil. Once the water is boiling, add the ginger, cover and reduce the heat. Let the tea simmer for about 15 to 20 minutes and then strain the liquid into a teacup. Add lemon and honey to your liking, but remember that you should avoid sugar if you are taking this tea medicinally. Drink and enjoy! Take your ginger tea after each meal to improve your digestion. Be prepared for a delicious, pungent flavor. This is a tea with a certain spice and heat to it. 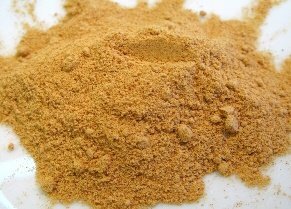 If you don’t have fresh ginger root with you can always grab the powdered ginger from the spice rack. 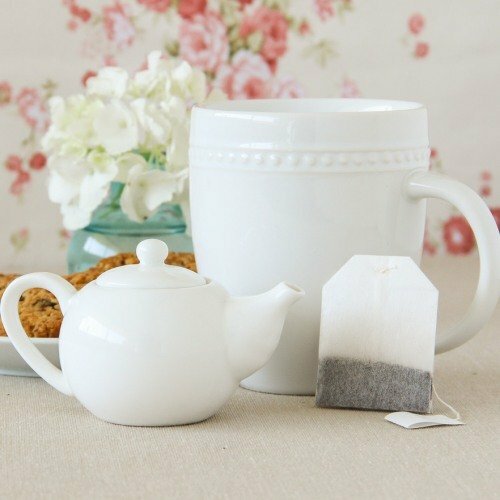 It’s easy to make a cup of tea: just add 1 teaspoon of powdered ginger per cup of boiling water. Add lemon and honey to taste and then drink. 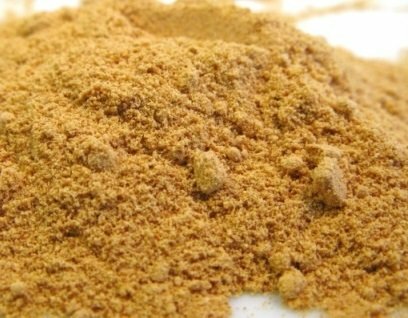 Always keep powdered ginger in the house, it stores for a longer period of time and it’s great for a quick cup of tea. It can also be added to your savory dishes and to boost the flavor of any homemade cookie. And it can also be quickly added to a bath for sore muscles. Ginger blends really well with other teas, particularly cinnamon tea or black tea. You may try to add it to less flavorful herbs and combine the healing powers of two herbs in one teacup. You don’t always have to drink ginger tea hot. During the summer, you may try it as an iced tea, like a cocktail to end your day. It will work as a tonic to cleanse your body of toxins. 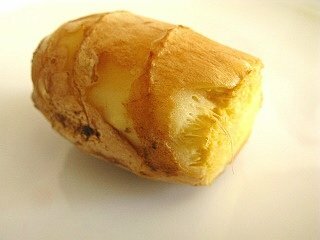 Place your ginger in a plastic bag in the fridge, but be careful not to use parts of the root where the skin feels wrinkled, has mold or the ginger underneath feels soft. Do not peel the ginger until you are going to use it. 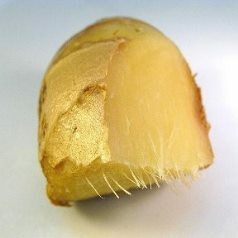 You can reutilize ginger, by spooning the slices from the teapot, then wrapping in foil and placing in the refrigerator. These slices will last up to 3 times before they begin to lose their spicy flavor. Buy Your Ginger Tea Today! 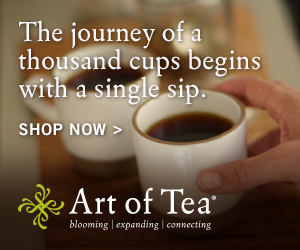 Click on the image or on the link below to purchase from Art of Tea your Ginger Ginseng Tea. 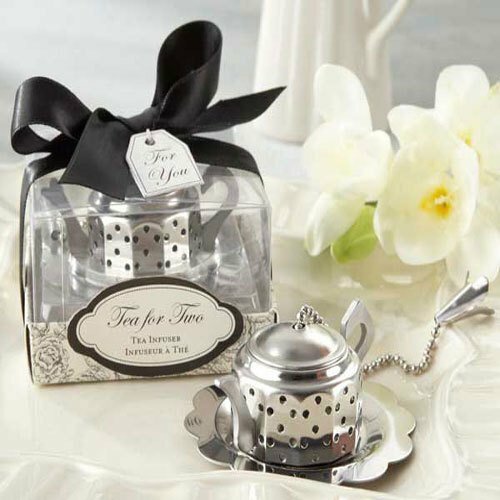 Brew a cup of the best refreshing and revitalizing tea with this amazing blend. Every ingredient is organic: ginger, ginseng, chamomile, mint, orange peel and rosehips. Let the heat in ginger run through your body and reap the great of benefits of tea every day. May ginger root tea be the right tea for you!